In 1920 many train journeys to Birmingham from Sutton were made on the Midland Railway. This line ran from Walsall through Sutton Park and Walmley to join the Midland main line at Castle Bromwich; there were three stations in Sutton, Sutton Park, Sutton Town and Penns (Walmley). 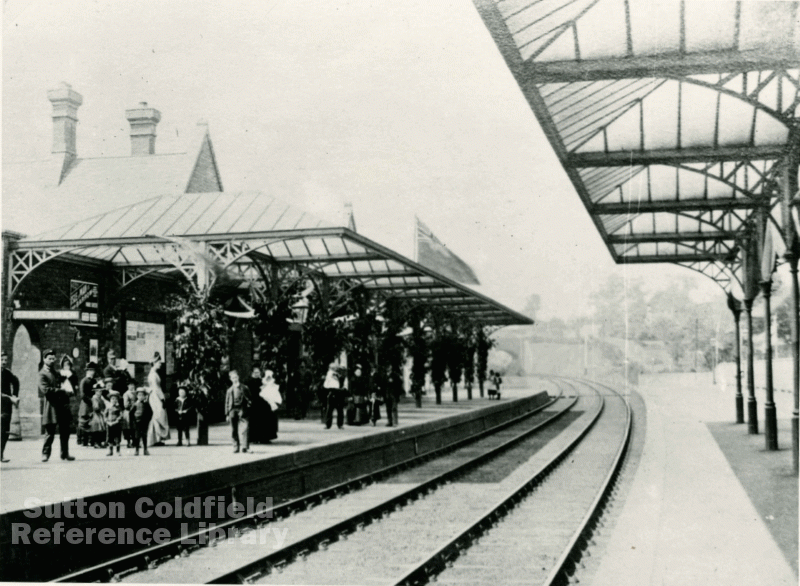 Sutton Coldfield Town station was built to the east of High Street; it was on a curve, and, at the south end near the Rectory Road bridge, on a high embankment. A new road, Midland Drive, was made to give access to the station when it opened in 1879, several of the High Street properties being demolished at one end, the other end opening on to Rectory Road. Midland Drive gave access to the platform for “up” trains to Walsall; there was no footbridge, so passengers for Birmingham crossed the line to the “down” platform on a walkway over the rails. There was another entrance to the station from High Street, a long driveway leading from the bridge alongside the track. This driveway is still there, now overgrown; in 1884 the Lichfield Extension Railway was constructed, passing beneath the Midland line, and this driveway was carried over the Lichfield line by a bridge strong enough to carry cycles and horse-drawn carts, but too weak for motorised vehicles. It gave access to the down platform, so getting to the up platform entailed using the hazardous footway. There were twelve trains each way in 1920, the journey time to New Street being twenty-five minutes (The stopping trains on the London and North Western Railway took thirty minutes). Once past Royal Road the line ran down an incline though open country as far as Castle Bromwich - Walmley Village was then a very small settlement. Down trains often struggled up the incline; as the line had originally been built mainly for freight traffic, the heavy goods trains puffing up the Sutton Bank often caused delays for passengers. In 1920 there were numerous independent railway companies, but in 1923 an Act of Parliament compelled railways to merge into one of four groups, Southern, Great Western, London and North Eastern, and London Midland and Scottish (LMS). So in 1924 both the Sutton Railways became part of the LMS network, and that company decided to rationalise their Sutton business by closing one of the stations - Sutton Coldfield Town. The Mayor of Sutton sent a petition to the directors of the LMS calling for the station to remain open, signed by over 500 people who, it was claimed, were regular users of it, but the station was closed on January 1st 1925, having served the town for 46 years. Passenger services still used the line, however, calling at Sutton Park and Penns, until 1963 when they were withdrawn as part of the “Beeching” cuts.